Back from the 3rd ECI conference 2012! Everyday, for 3 days, there were 4 plenary sessions in the morning and 12 workshops in the afternoon to choose from, thus it was important to go through the program well in advance :] This year the line up was very very good and some talks were simply outstanding! Thus, here, I would only like to highlight a couple of the talks/speakers that I found very challenging and exciting. Of course, this selection is very personal since I could not attend to all the talks and one is always driven by its own favorite subjects and mine are about peripheral T cell differentiation and effector functions. Finally, I do apologize for the talks I missed and that will not be highlighted here. Of note all the abstracts are available here on the EJI website. Before starting I want to quote the slogan of the conference: “A Healthier Future through Research, Education and Innovation”! Sometimes the national politicians of European countries should be reminded the importance of supporting research! – Tim Vyse (London, UK) presented a very nice genome-wide association study (GWAS) on Systemic Lupus Erythematosus (SLE). Interestingly 3 genes came up with high polymorphism: OX40L, MHC, CD11b with some variants associated with risks and other associated with non-risks. This came as a surprise; for it didn’t occur to me that polymorphism could affect OX40L,!! But the explanation is that polymorphism can be in the non coding regions. One nucleotide change creates a NF-kB binding site that leads to increase in OX40L expression. Impressive no!? – Eddy Liew (Glasgow, UK) is dissecting in details the role of the fairly recently discovered cytokine: IL-33. Of note, in 1998 ST2 was shown to be associated with Th2 but not Th1 cells. ST2 belong to Toll/IL1 receptor TIR super family (that includes TLR, IL1R, IL18R, T1/ST2). Then, in 2005 IL-33 was identified as the ligand for T1/ST2, and shown to be produced by a larga variety of cells including Th2, mast cells, macrophages, eosinophils, neutrophils, B1 cells. 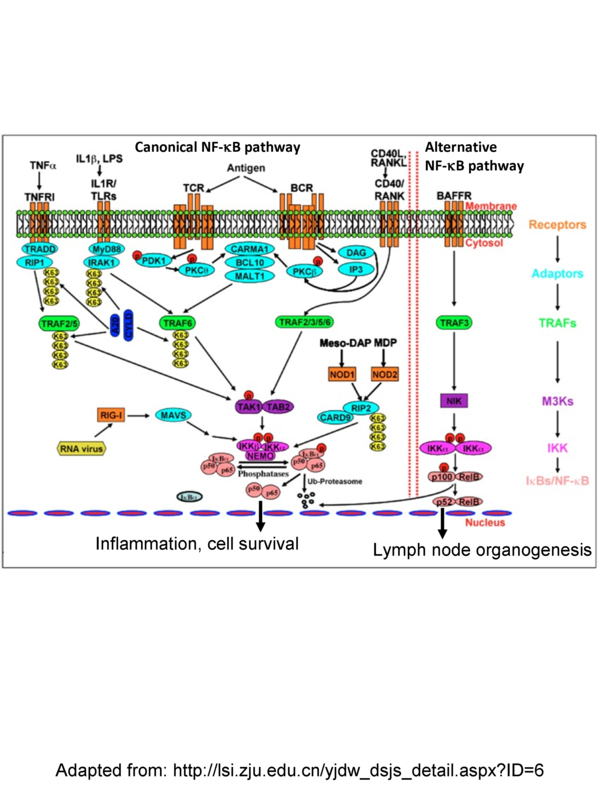 –	IL-33 attenuates sepsis via a mechanism involving neutrophil migration through the CXCL2/CXCR2 axis by maintaining the expression of CXCR2. This was demonstrated via IL-33 injection. –	Less surprisingly however, IL-33 plays a role in asthma. Indeed several intranasal injection of IL-33 mediates airway inflammation, via the recruitment of Nuocytes through an mToR pathway. In conclusion, IL-33 defends against infection, attenuate type I inflammation and exacerbate allergy. This highlights the importance of untangling the bag of knots that is constituted by all the signaling partners, such as their specific expression in certain cell types and their selective roles in these. In a very interesting talk, Dr. Lawrence demonstrates that IKKα couples innate and adaptive immunity. IKKα is shown to have anti-inflammatory role. 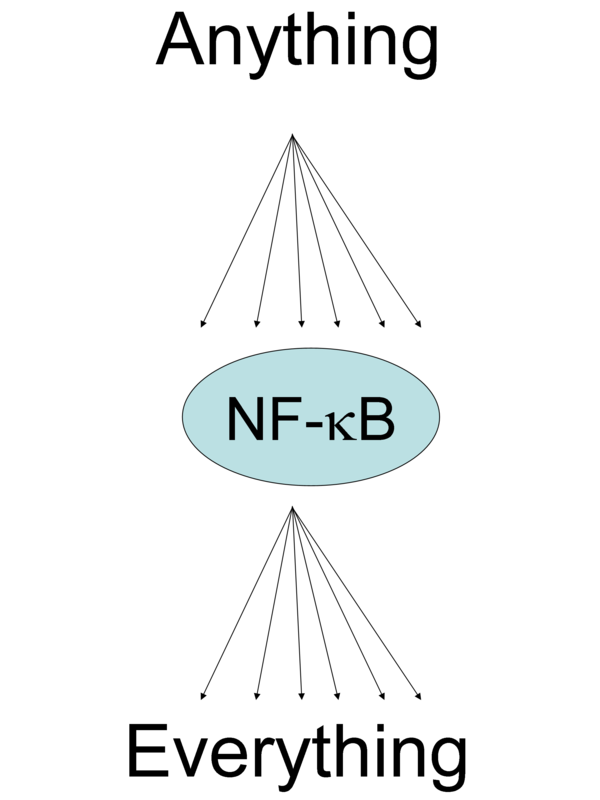 For instance, it inhibits the canonical NF-κB activation in macrophages. Indeed, IKKα mice infected with Listeria monocytogenes show a reduction of the bacterial load and an increase of cell death by sepsis. Using a model of ovalbumin-expressing Listeria monocytogenes (LM-OVA), he went on to show that the defect is attributable to IKKα-/- dendritic cells. These IKKα-/- DC are impaired in the production of IL-12 and IFN- β. The mechanism of action links TLR (3/4) – IKKα that phosphorylates directly IRF3 to shape the response of the DC. 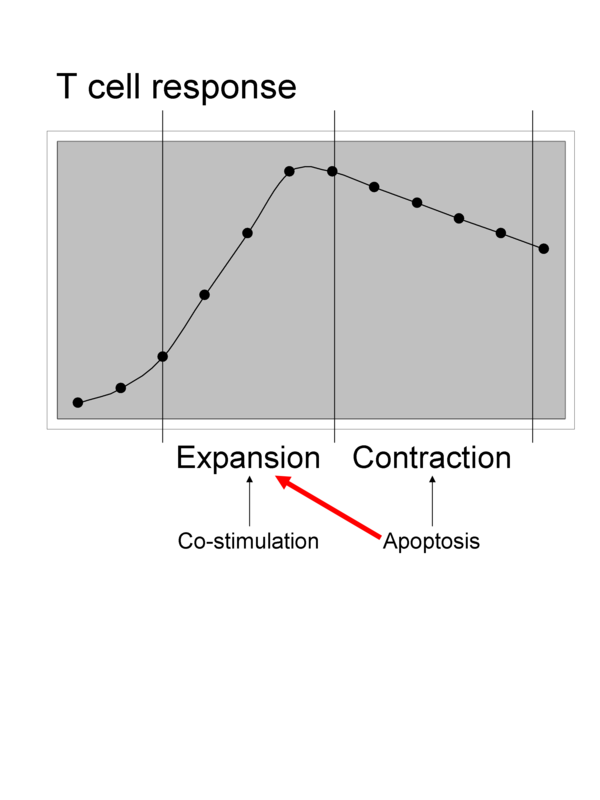 – Eric Eldering (Amsterdam, Netherlands) highlighted the importance of apoptosis, which is usually associated with the contraction phase of a T cell response, also with the expansion phase. They found that Noxa, a proapoptotic BH3 (Bcl-2 homology 3)-only subgroup of the Bcl-2 (B-cell CLL/lymphoma 2) family, was induced upon TCR triggering in T cells. Furthermore deficiency in Noxa protects against cell death, and indeed he shows that Noxa-/- OTI cells have a higher apoptosis threshold and therefore have a competitive advantage during immune response compare to normal OTI cells. Noxa acts through MCL1 protein binding partner and via IL-2 signaling to modulate T cell fitness during a response. – Sometime when you hear the first words of the introduction, such as Post Operative Ileus (that is a transient cessation of coordinated intestinal motor activity following abdominal surgery), you think oh my gosh “this talk I will sleep through” and then to your surprise Christian Kurtz (Bonn, Germany) keeps you completely hooked to his talk from beginning to end! If you give fluorescent food to a mouse you can track the speed at which it transits simply by measuring fluorescence in various location of the digestive tract. Very surprisingly, POI was dramatically affected in mice deficient in CD4 T cells, which have almost normal gut motility! Then it was observed that the effect of CD4 T cells is antigen-dependent, but also involves Th1 features including IFN- γ, T-bet. Furthermore, the important cell type seems to be CD11c+ dendritic cells. In the intestine the majority of DC are CD11c+CD103-CX3CR1+ and depend on CCR2. Surprisingly however, in CCR2-/- mice suffer from POI. So in fact the DC subset responsible is CD103+CD11c+CD11b+BATF3+. How the spreading for instance from small to large intestine operates still remains unclear. Whether the cells migrate from blood, portal vein, lymphatics is still to elucidate. Nevertheless, there is a dramatic increase in CD4+CCR9+ and IFNg/ml in blood that happens in hours after surgery. A very unexpectedly fascinating talk really! – Toni Schumacher (Amsterdam, Netherlands) [the inventor of the Barcode technology used for resolving paradoxes of the immune system], nicely questioned whether the total T cell response is controlled at the single cell level or by averaging (see slide below). The technology is described in the following papers Dissecting T cell lineage relationships by cellular barcoding, or Mapping the life histories of T cells. Using this approach he barcoded identical CD8 T cells derived from OTI mice, transferred them into recipient that were subsequently immunized with ovalbumin-expressing Listeria monocytogenes (LM-OVA). At the peak of the infection, responding OTI cells were isolated and the family sizes were quantified by deep sequencing. The result was quite surprising as even though the response is mounted from an homogeneous population the clonal disparity was very large. This means that many cells were engaged in the response and were able to mount a response to various degrees. Of note: the downside of this technology is that there is no information as to when a clone came into the response. There is a possibility that the diversity in the response could be due to an asynchrony in the pool of OTI cells responding to the LM-OVA . Nevertheless, irrespective of the TCR some cells are more fit than others. It seems however that there an increase in the diversification during secondary responses. This was map to the fact that small families are CD62L+ and large families tend to be CD62L-. As a consequence, small and undifferentiated families do better during recall secondary responses. Even though this seems “logical” it was worth demonstrating it! Then, Dr. Schumacher ended with an interesting concept to explain family pattern, which is that “sister behave alive”. This can be due either because i) there are in the same micro-environment or ii) the grand-mother cells dictate the behavior of the following descendent daughters. – Randi Franke (Germany) presented data on the role of the inducible costimulator ICOS in the regulation of T follicular helper cells. I am not quite sure of how novel the role of ICOS in the differentiation of TFh cells is, but the study here was well presented and well conducted. For instance, the co-injection of OTII and ICOS-/-OTII cells distinguishable via Thy1.1 / Thy1.2 clearly show that immunization with ovalbumin induces only OTII cells to differentiate into PD-1+CXCR5+ TFh cells. Although in the absence of ICOS cells up-regulated Bcl6 they failed to up-regulate Cxcr5. Moreover, blockade of ICOS with an anti-ICOSL induces increase in Ccr7 and decrease in Batf, PD-1, IL-21, and IL-4 as assessed via microarrays. – Gitta Stockinger (London, UK) presented her very elegant data on the fate mapping of IL-17-producing CD4 T cells. Using this model she can track the history of a cell that has at one point in its life opened up the Il17 locus and most likely produced IL-17. By RT-PCR it was shown that IL-17+eYFP+ have increased expression of Il22, Gm-csf, Ifng, and Tnfa. Surprisingly, in the lung of animal maintained in germ free conditions there is still 50% of the γδ T cells that are IL-17+eYFP+. Finally, during Candida infection IL-17+eYFP+ CD4 T cells co-expressed IL-22 but not IL-17f. The infection induced about 2% of IL-17+eYFP+ CD4 T cells and about 10% of IL-17+eYFP+ γδ T cells. Surprisingly however, no conversion to TFh cells was observed during Candida or Staphylococcus aureus infection. A very fascinating talk indeed, about the physiology of the Th17 cells!! Benedita’s claim is to say that cognate responses do initiate an inflammatory response. I have to say this was one of my favorite sessions! – I was completely blown away by Shimon Sakaguchi (Osaka/Kyoto, Japan) ’s presentation! He questioned the relative roles of genetic and epigenetic mechanisms in the development of regulatory T cells (Treg). Little is known about the regulation of expression of Foxp3 and other transcription factors associated to Treg, such as Helios and Eos. How genetic and epigenetic cooperate to regulate the fate of Treg? Is Foxp3 upstream of epigenetic DNA and histone modifications? Is it the contrary, with epigenetic upstream of Foxp3 expression? Or are these two mechanisms independent? To address this, and dissect the involvement of gene expression and epigenetic mechanisms, methylated DNA immunoprecipitation sequencing (Me-Deep-Seq) was performed. He found that thymus-derived naturally occurring Treg and periphery-derived induced Treg had very similar overlapping DNA methylation marks. Indeed, there was specific signature of DNA demethylation, associated with gene expression, in Foxp3, CD25, GITR, CTL4A and Eos. A mouse model system was developed to assess Treg “maturation” by using Rosa26-RFP, Foxp3-Cre and Foxp3-GFP. By combining all this models, it was shown that Foxp3 and Epigenetic act in concert, though independently, for the generation of Treg cells. Of note: an interesting question was raised: What is the role / importance of histone modification compared to DNA methylation in T cells differentiation? The answer was that gene expression is more strongly controlled through DNA methylation than histone modifications. As to whether this is absolutely certain I doubt, but everyone uses their favorite model :]. – Then Sebastian Amigorena (Paris, France) presenting data supporting an important role for Treg in the regulation of the diversification of clonal CD8 T cell affinity during immune response. Tregs act through a mechanism involving chemokines including CCL3, CCL4, CCL5, to keep the affinity of CD8 T cells high by competition and killing of antigen-presenting DC. Sebastian Amigorena is a very good speaker fun to watch and always presenting interesting and challenging stories! – Simon Fillatreau (Berlin, Germany) highlighted the biological relevance of “regulatory B cells” (can we call them Breg??) that produce IL-10 but not only! There is also evidence for likely direct interaction between the B cells and T cells. This is suggested by the severity of the disease than is increased in chimeras reconstituted to have only B cells deficient in CD40-/-. Interestingly, when B cells are subjected to stimulation with anti-CD40 + LPS there is up-regulation of EBi3, CCL5, TNFsf9, IL-6, CCL22. In search for the suppressing factor regulating the severity of EAE, IL-35 (EBi3+p35) was found to be the major cytokine. While chimeras reconstituted with B cells deficient in p35 show increase severity of EAE, B cells deficient in p28 or p40 developed normal disease. This field is only starting to exponentially grow in . I am wondering whether we are going to discover “master” regulator of DNA CpG island methylation and histone modifiers for specific immune functions in specific immune cell types, as we already have “master” transcription factors? – For instance, Stefano Casola (Milan, Italy) nicely showed that a member of the polycomb family EZH2 that tri-methylates histone 3 in K27 is highly and specifically expressed in CXCR4+ germinal centre B cells in the dark zone. They developed a very elegant model to selectively deplete EZH2 in B cells responding to antigen challenge. To do so, they crossed floxed EZH2 mouse with Cγ1-cre mouse. 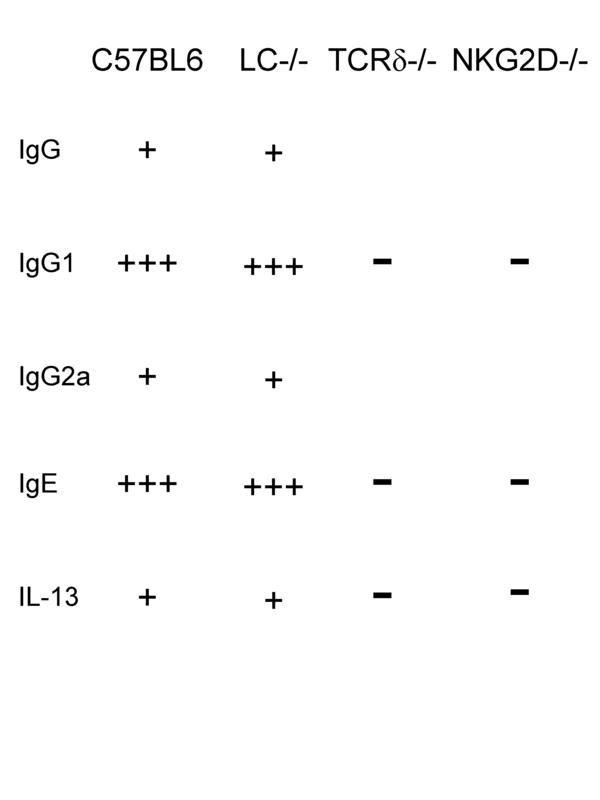 Thus, every B cells that respond to immunization (Ag-Alum) induced the expression of the Cre recombinase via the transcription of the Ig gamma1 constant segment. Thus every B cells that start class switch recombination will delete EZH2. As a consequence, there is a dramatic decrease in the germinal centre formation, memory B cell response and antibody production. By contrast, there are more CD138+ B cells. Surprisingly (and I don’t quite understand why), the phenotype was rescued in AID-/- mice. Dr. Casola proposed a model whereby, EZH2 negatively controls the expression of Blimp1 and IRF4, while inducing the expression of BCL6, possibly AID and promoting proliferation. To my knowledge, this is one of the first studies, associating EZH2 a regulator of H3K27 trimethylation, to a specific cell type and function . –	In addition, Peter Cook (Edinburgh, Scotland) presented more intriguing data showing the role of CpG island methylation in immune cells and in particular of the methyl CpG binding domain protein 2 (methylation reader MBD2). Assessment of immune functions in MBD2-deficient mice shows that there is a decrease in some genre expression associated with Th1 (IFN-γ in T cells) or Th2 (RelMα, IL-10 in DC), consistent with the role of MBD2 as a transcriptional repressor. – M. Lang (Oklahoma, USA) brought me back to one of my old favorite subject, the mechanism of action of Alum adjuvant. Here, the type II NKT cells are shown to play a role during responses induced by Alum and increase the humoral immunity. NKT cells are specialized T cells that recognize lipid antigens presented by CD1d molecules and also express NK cell receptors. Before getting into details, I need a refresh about NKT cells. The classical/type I NKT cells carry an invariant TCR using the Vα14Jα18 TCR α-chain and are the most prevalent. Type II NKT cells with a more diverse TCR repertoire; have been identified in both humans and mice. Thus, type I NKT cell-deficient Jα18KO mice retain type II NKT cells while CD1dKO mice are deficient in type I and II NKT cells. Interestingly, antigen-specific antibodies titers are compromised in mice type II NKT cells. This is illustrated by the defect in seric anti-NP after NP-KLH-Alum immunization. Mechanistically, alum does not change CD1d levels, and its adjuvant effect seems to be dependent on IL-4/IL-13. – I also have to admit that for the first time I saw Marc Bonneville (Nantes, France). He is a very good speaker, and I really enjoyed his talk! He essentially presented data from their recently published paper in Blood Key implication of CD277/butyrophilin-3 (BTN3A) in cellular stress sensing by a major human γδ T-cell subset. – As is usually the case a very good presentation from Philippe Bousso (Paris, France). I very much appreciate his constant efforts to make meaningful data of the microscopy two-photons. To do so, he has participated in the development of novel software to facilitate the analysis of confocal data. It is now possible to convert very complex raw information into more user friendly dot plots that can be assimilated to FACS dot plots. This surely will help our interpretation of intra vital, time-dependent microscopy results. The software is called DISC (dynamic in cytometry software). This methodology was nicely validated by measuring the shredding of CD62L to track TCR engagement, the extent of TCR signaling and consequently T cell activation. Surprisingly, maximum down-regulation of CD62L occurs in vivo during the first 6h after immunization. In the second part of his talk he gave us insights into the range of action of the cytokine IFN-γ in vivo in lymph nodes. The question is raised because during Leishmania major infection the production of IFN-γ is restricted to a very small number of activated T cells. Therefore, it has to be assumed that IFN- γ produced by one T cell can act at distance to induce INOS expression in infected cells. They assessed the spatial diffusion of CD4 T cell effector function. They show that local production of IFN-γ by T cells affects INOS production to a large circle of around 100um. Jessica Strid (Paris, France) presented counter-intuitive results on down-stream consequences of NKG2D engagement. This molecule frequently expressed by cells that belong to the innate arm of the immune system has often been associated with anti-tumour responses and the induction of cytotoxicity. Intriguingly, she demonstrated that an early response to cutaneous carcinogen is the strong induction of IL-13 and IL-4 along with IgG1 and IgE antibodies! Importantly, this Th2 response is completely dependent on γδ T cells (but not on Langerhans cells) and the molecule NKG2D. Therefore, the potent induction of Th2-features under the control of NKG2D, which is essentially expressed on γδ DETC cells and not on Langerhans cells, is novel and paradoxical since this receptor has so far been associated with tumour response. Furthermore, Th2 response are not usually linked to protection against tumour. We are left now to understand why stress-induced cutaneous responses, induced such a strong Th2 bias and whether this is deleterious or protective to host tumour eradication.